The Padres have signed Mike Olt to a minor league deal which does not contain an invite to big league Spring Training, per Dennis Lin of the San Diego Union Tribune. The 27-year-old Olt will head to minor league camp. Olt’s signing was first noted by MadFriars.com, who tweeted a picture of Olt in uniform at Spring Training. 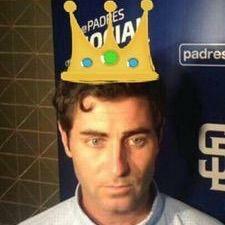 Olt’s deal with the Padres will reunite him with general manager A.J. Preller, who was an assistant GM with the Rangers when Olt was one of the game’s top-ranked prospect as a member of the Rangers organization. The former No. 49 overall pick in the 2010 draft, Olt’s big-time right-handed power quickly landed him among the game’s Top 30 prospects in the eyes of MLB.com, Baseball America and Baseball Prospectus. The UConn product’s best season in the minors came in 2012, when he slashed .288/.398/.579 with 28 homers at the Double-A level. Olt has never hit much in the Majors, amassing just a .168/.250/.330 batting line with a jarring 37 percent strikeout rate. Contact has long been an issue for the slugger, who split the 2015 campaign between the Cubs and White Sox but was released by the latter earlier this week. Olt missed considerable time last season with a fractured wrist suffered early in the year upon being hit by a pitch. He’ll give the Padres some depth at the infield corners, with third base being a particularly thin area for the organization. Enjoy Padres. Maybe you see something three other teams didn’t see. I doubt it. Interesting depth piece that Preller has history with.Maybe he’ll get a call-up later in the season. So he can hit .160 with the Padres? Except for hitting the ball he’s a good hitter, and aside from catching the ball he plays good defense. Fix hes swing and make him a 1st baseman. Then maybe you can squeeze out 260 average with a 300 obp and have some right handed power bat. Not so good at 3rd. Wishing him luck. Seemed to be a good kid (who obviously has not figured out how to to control strike zone or a count). Not sure what (if any) long term or lingering effects he still has from the eye injury.